Now, we explain how to customize the properties for an element through design a knife component. Now, explain how to do it. Please name the lines as Line1, Line3, Line2 and Line4 according to above numbers. 7. 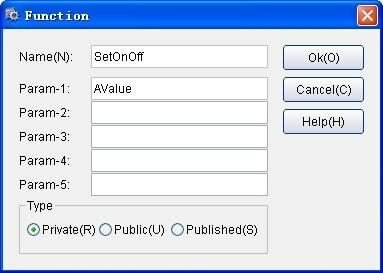 Rename current sheet as HKnife (change its Name property). 8. Save current file as c:\libtest.tbl. Now, you can change OnOff property to let the HKnife1 On or Off even in the Design mode.
' Change file to the actual one that contains a HKnife element and named HKnife1. To operate HKnife1 in Visual Graph scripting language, please select HKnife1 and double-click OnClick event in the Functions view, write the following code, and then click Program -> Run menu item. Just click HKnife1 to experience your good work.